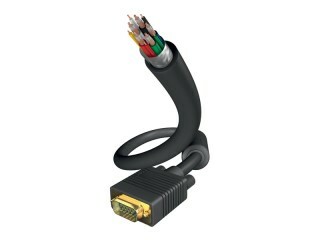 Enlarge The high-quality VGA cable with separate shielded signal conductors has an additional overall screening. Robust, moulded plugs with gold-plated contacts provide the best possible contact. The ferrite core in the ends of the cables protect against electrical interference. For instance, it is ideal for connecting a PC or laptop to a TV or projector.